A couple of weeks ago Milla’s class were asked to design sandwiches. They were able to choose from a range of ingredients and Milla settled on ham and mustard on a bagel. 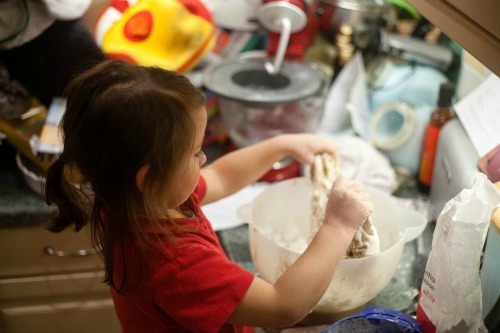 I knocked up a quick dough before Milla came home so it was ready for her to work and cook. As breads go bagels are a great bread to bake with children as the proves aren’t too long and there’s plenty of work to do. Rather than wrap the bagels into rounds we used a wooden spoon to make a hole and then spun them around the handle. 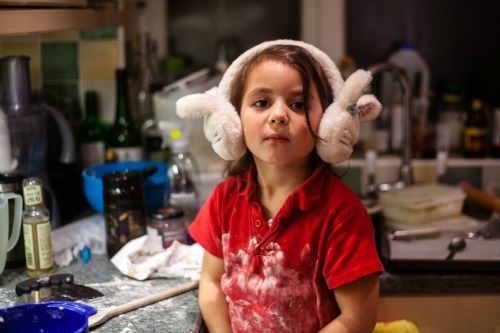 This is pretty much the most fun we’ve had bread making. Although you have the extra stage of poaching the bagels I still consider them an easy bake not least because they come together pretty quickly. The only thing which could slow it down is a slow first prove but despite the cold weather mine took just under an hour thanks to my Great British Bake Off proving drawer (ok, ok, it’s the top rack of a recently finished dishwasher). Put half of the water in your mixing bowl along with the yeast and 1 tbsp of sugar. Lightly whisk them together then leave for 10 – 15 minutes by which time you should have froth on the top of the water. Stir the salt into the remaining water and add to your yeast mixture. Next you’ll add the flour starting with about 200g then a little at a time* until you have a soft and silky dough. Knead the dough for ten minutes. Then roll into a lightly oiled bowl, cover with a damp tea towel and leave to prove until doubled in size. Preheat oven to 200°C and bring a large pan of water to the boil with 2 tbsp of sugar. 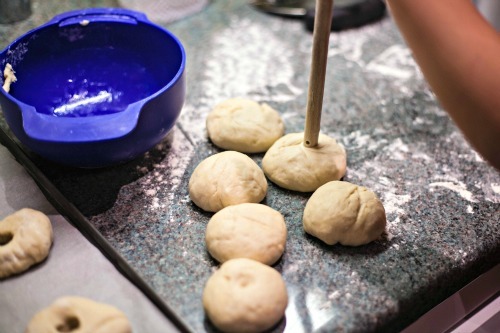 Divide your dough into 8 – 10 small balls depending on how many bagels you want. Flour the surface and use a floured wooden spoon handle to poke a hole right through the middle. Give the bagel a quick swing around the spoon until you have a hole of a bit bigger then a finger. 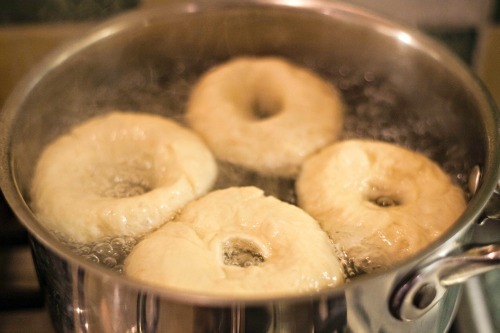 Drop 3 – 4 bagels into the boiling water and then let them poach for 30 seconds on each side once they have risen to the top. The dough should have a puffed up skin. Use a slotted spoon to lift them out of the water and set on a floured or lined baking tray. If you want to add toppings to your bagel roll them on a plate of topping right after you bring them out of the water. Bake in the oven for 20 – 25 minutes until the tops are golden and they sound hollow when you tap the bases. 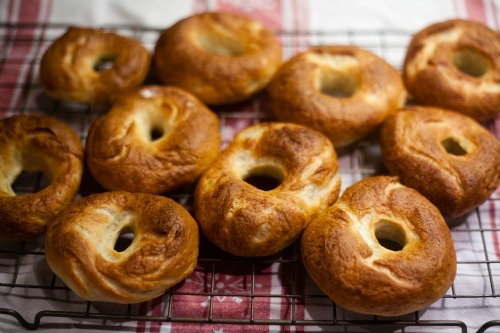 *I’ve tried water into flour and flour into water and this method seems to work better for the bagels. Perhaps wear an apron, eh? As a total bread novice I am determined to give these a go with the twins. delicious. we’ll have to give this whirl. I can’t remember the last time I had a real fresh bagel. What a great idea. 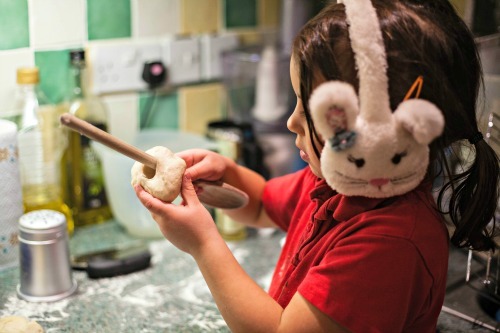 My daughter loves poking her fingers into foccacia dough to make the holes that we drizzle olive oil and sprinkle rosemary over – but I think she’d like spinning bagels around a wooden spoon handle even more. Delicious looking results too. They look delicious, I shall have to give them a whirl. Thank you for the recipe.